Layout Editor: A new user interface designer that helps you visually design the layouts in your app. Features like blueprint mode and the new properties panel allow you to quickly edit layouts and widgets faster. Constraint Layout: A new powerful and flexible Android layout that allows you to express complex UIs without nesting multiple layouts. Layout Inspector: Debug a snapshot of your app layout running on the Android Emulator or device. Inspect the view hierarchy and corresponding attributes. 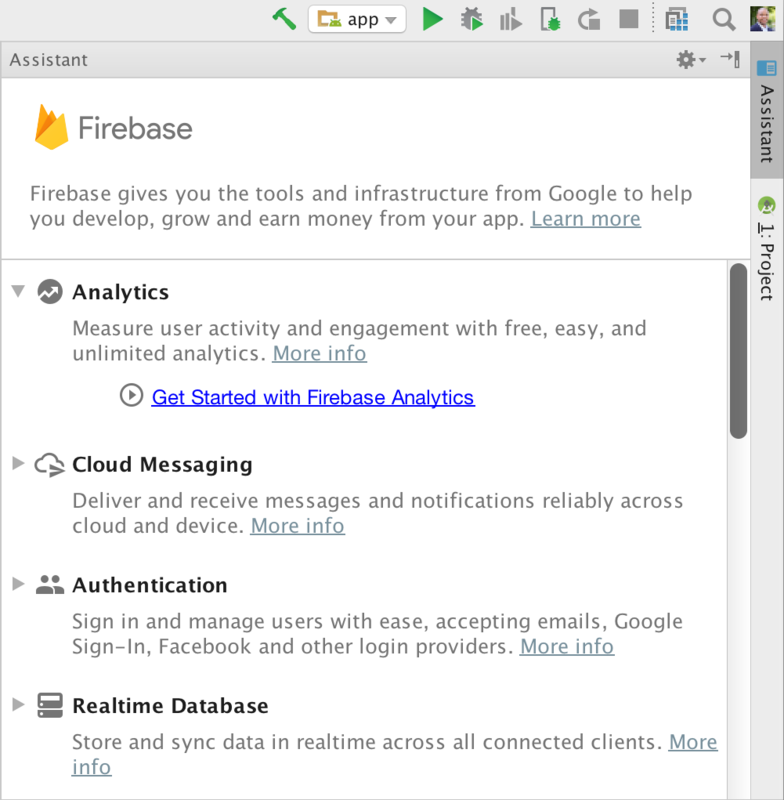 Firebase Plugin: Explore and integrate the suite of services offered by Firebase inside of Android Studio. Adding services like Analytics, Authentication, Notifications, and AdMob are just a few clicks away. 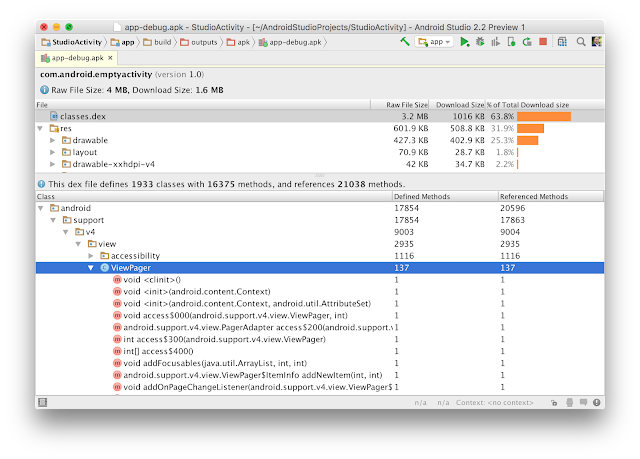 Enhanced Code Analysis: Android Studio checks the quality of your Android app code. In addition to 260 Android lint and code inspections, this release includes new code quality checks for Java 8 language usage and a new inspection infrastructure for more cross-file analysis. Samples Browser: Referencing Android sample code is now even easier. Within the code editor window, find occurrences of your app code snippets in Google Android sample code to help jump start your app development. Improved C++ Support: Android Studio 2.2 improves C++ development with the ability to edit, build, and debug pre-existing Android projects that use ndk-build or CMake rather than Gradle. Additionally, the existing lldb C++ debugger is now even better with project type auto-detection and a Java language aware C++ mode that lets you use a single debugger process to inspect both Java language and C++ runtimes. IntelliJ 2016.1: Android Studio 2.2 includes all the latest updates from the underlying JetBrains product platformsIntelliJ. 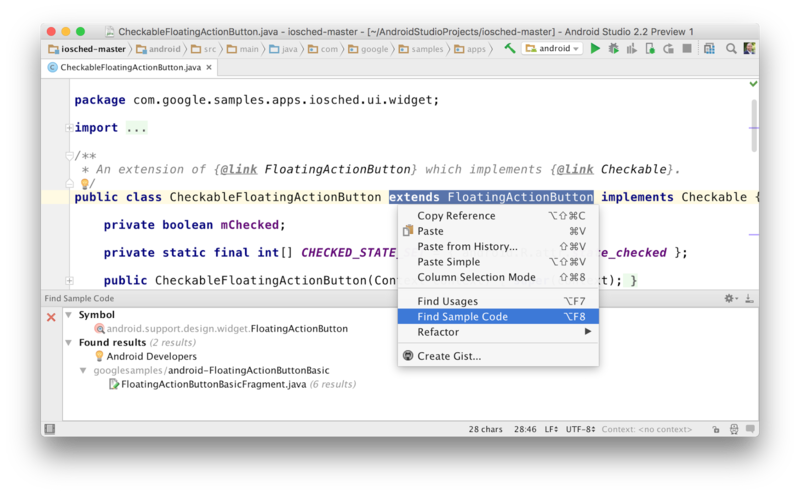 Jack Compiler Improvements: For those using the new Jack compiler, Android Studio 2.2 adds support for annotation processing, as well as incremental builds for reduced build times. Merged Manifest Viewer: Diagnose how your AndroidManifest.xml merges with your app dependences across your project build variants. Espresso Test Recorder: Record Espresso UI tests simply by using your app as a normal user. As you click through your app UI, reusable and editable test code is then generated for you. You can run the generated tests locally, in your Continuous Integration environment, or in Firebase Test lab. APK Analyzer: Drill into your APK to help you reduce your APK size, debug 64K method limit issues, view contents of Dex files and more. Drag-and-drop widgets from the palette to the design surface or the component tree view of your app. Design surface has a blueprint mode to inspect the spacing and arrangement of your layout. Properties panel now shows a curated set of properties for quick widget edits with a full sheet of advanced properties one click away. UI builder can edit menu and system preference files. 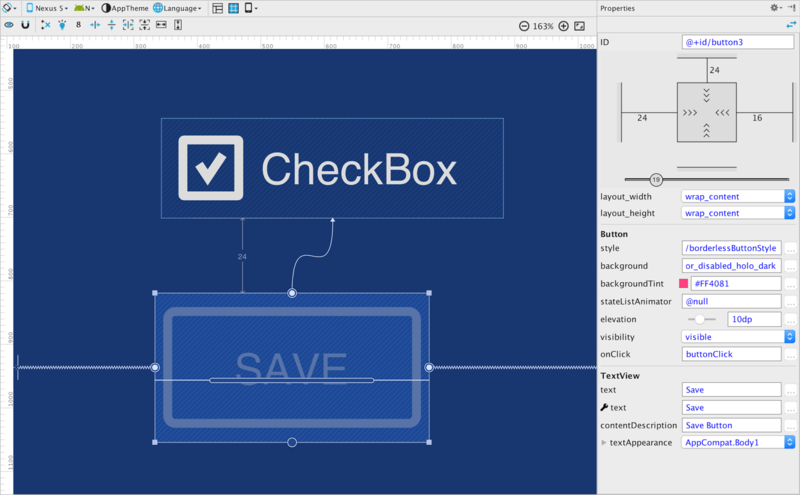 Constraint Layout: This new layout is a flexible layout manager for your app that allows you to create dynamic user interfaces without nesting multiple layouts. It is distributed as a support library that is tightly coupled with Android Studio and backwards compatible to API Level 9. At first glance, Constraint Layout is similar to RelativeLayout. However, the Constraint Layout was designed to be used in Studio and it can efficiently express your app design so that you rely on fewer layouts like LinearLayout, FrameLayout, TableLayout, or GridLayout. Lastly, with the built-in automatic constraints inference engine. 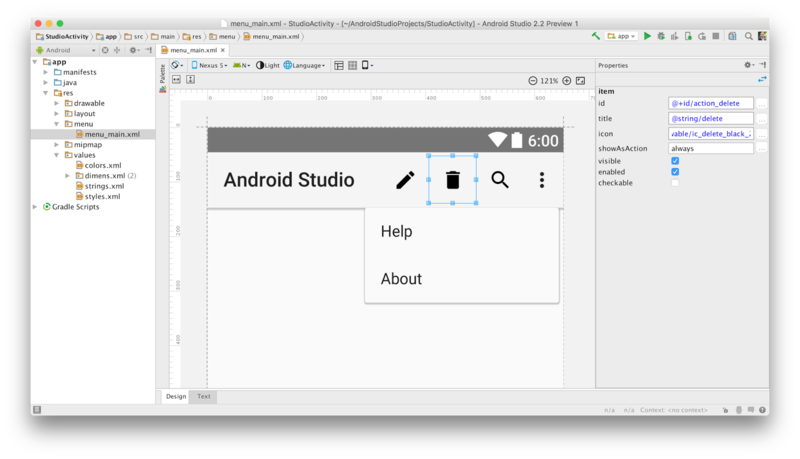 You can freely design your UI to your liking and let Android Studio do the hard work. To help you get started, the built-in templates in the New Project Wizard in Android Studio 2.2 Preview now generate a Constraint Layout. Alternately, you can right click on any layout in the new Layout Editor and select the Convert to ConstraintLayout option. This is an early preview of the UI designer and Constraint Layout, and we will rapidly add enchantments in upcoming releases. 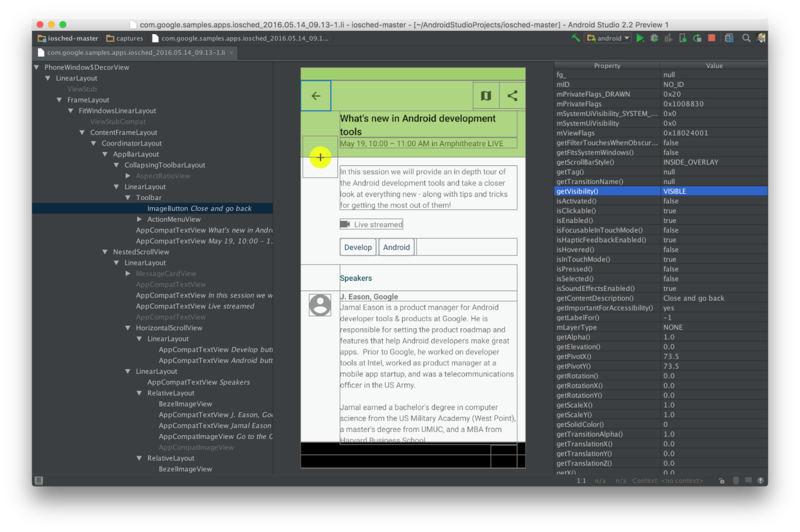 Learn more on the Android Studio tools site. Layout Inspector: For new and existing layouts, many times you may want to debug your app UI to determine if your layout is rendering as expected. With the new Layout Inspector, you can drill into the view hierarchy of your app and analyze the attributes of each component of UI on the screen. 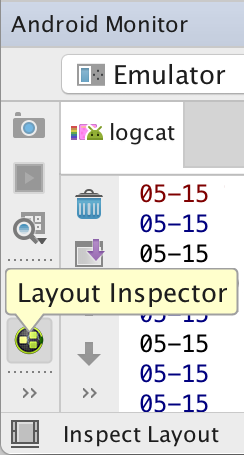 To use the tool, just click on Layout Inspector Icon in the Android Monitor Window, and then Android Studio creates a snapshot of the current view hierarchy of your app for you to inspect. Firebase Plugin: Firebase is the new suite of developers services that can help you develop high-quality apps, grow your user base, and earn more money. 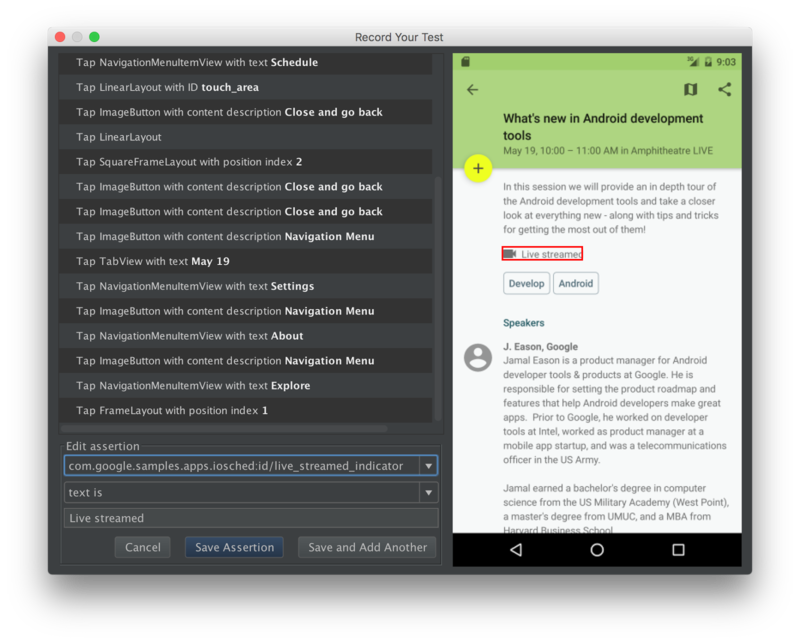 Inside of Android Studio, you can add Firebase to a new or existing Android app with the new Assistant window. To access the Firebase features click on the Toolsmenu and then select Firebase. You will want to first setup the brand new Firebase Analytics as the foundation as you explore other Firebase services like Firebase Cloud Messaging or Firease Crash Reporting to add your application. Learn more about the Firebase integration inside Android Studio here. Code Sample Browser: In addition to importing Android Samples, the Code Sample Browser is a menu option inside Android Studio 2.2 Preview that allows you to find high-quality, Google-provided Android code samples based on the currently highlighted symbol in your project. To use the feature, highlight a Variables, Types and Methods in your code then Right Click to show a context menu for Find Sample Code. The results are displayed in a bottom output box. 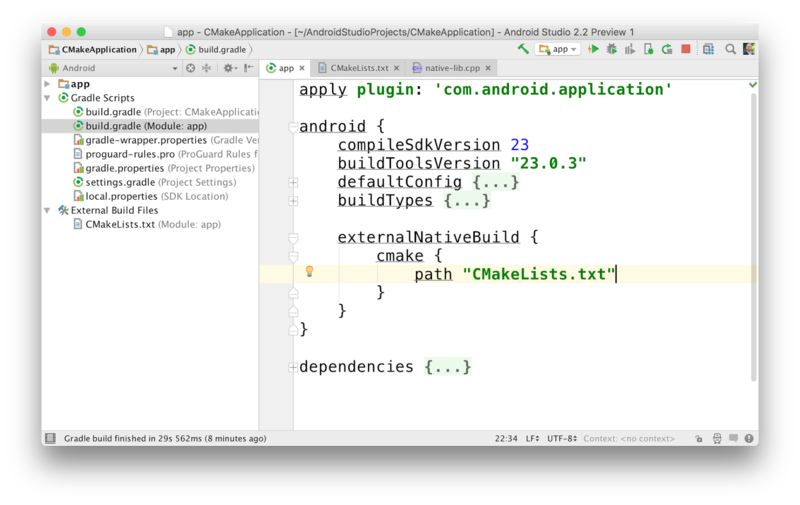 CMake and NDK-Build: For those of you using the Android NDK, Android Studio now supports building CMake and NDK-Build Android app projects by pointing Gradle at your existing build files. 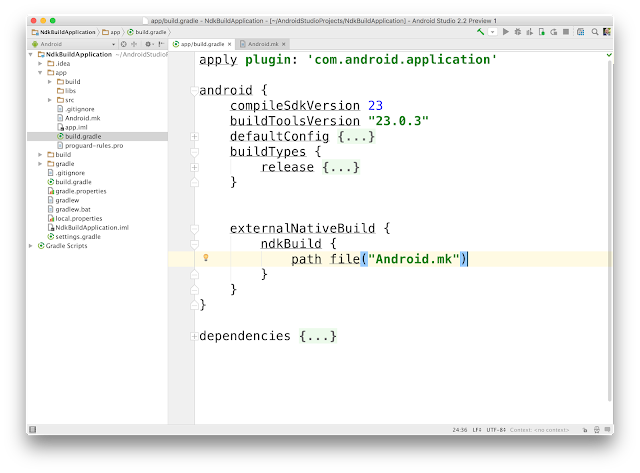 Once you’ve added your cmake or ndk-build project to Gradle, Android Studio will automatically open your relevant Android code files for editing and debugging in Studio. Improved Jack Tools: The new Jack Toolchain compiles your Java language source into Android dex bytecode. The Jack compiler allows some Java 8 language features, like lambdas, to be used on all versions of Android. This release adds incremental build and full support for annotation processing, so you can explore using Java 8 language features in your existing projects. 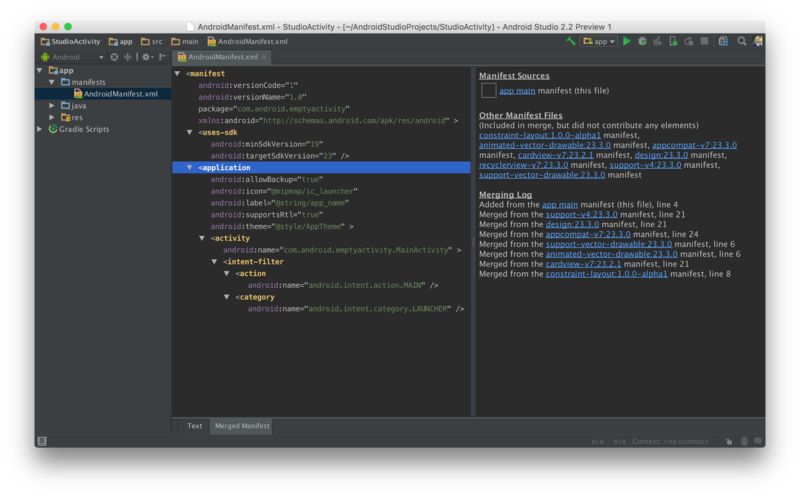 Merged Manifest Viewer: Figuring out how your AndroidManifest merges with your project dependencies based on build types, flavors and variants is now easier with Android Studio. Navigate to your AndroidManifest.xml and click on the new Merged Manifest bottom tab. Explore how each node of your AndroidManifest resolves with various project dependencies. Espresso Test Recorder: Sometimes writing UI tests can be tedious. With the Record Espresso UI tests feature, creating tests is now as easy as just using your app. 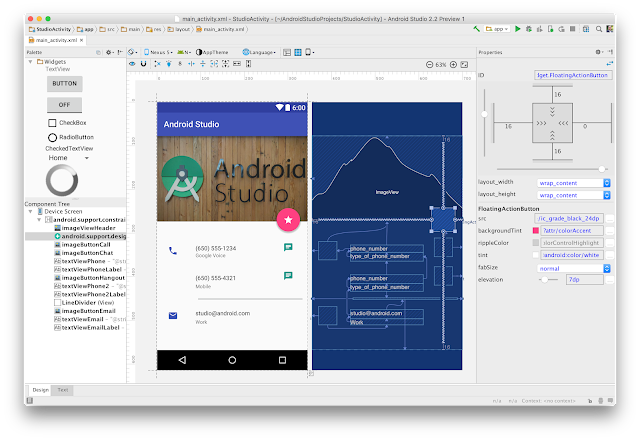 Android Studio will capture all your UI interactions and convert them into a fully reusable Espresso Test that you can run locally or even on Firebase Test lab. To use the recorder, go to the Run menu and select Record Espresso Test. APK Analyzer: The new APK Analyzer helps you understand the contents and the sizes of different components in your APK. You can also use it to avoid 64K referenced method limit issues with your Dex files, diagnose ProGuard configuration issues, view merged AndroidManifest.xml file, and inspect the compiled resources file (resources.arsc). This can help you reduce your APK size and ensure your APK contains exactly the things you expect. The APK Analyzer shows you both the raw file size as well as the download size of various components in your APK. The download size is the estimated size users need to download when the APK is served from Google Play. This information should help you prioritize where to focus in your size reduction efforts. To use this new feature, click on the Build menu and select Analyze APK… Then, select any APK that you want to analyze. Java-aware C++ Debugger: When debugging C++ code on targets running N and above, you can now use a single, Java language aware lldb instance. This debugger continues to support great lldb features like fast steps and memory watchpoints while also allowing you to stop on Java language breakpoints and view your Java language memory contents. 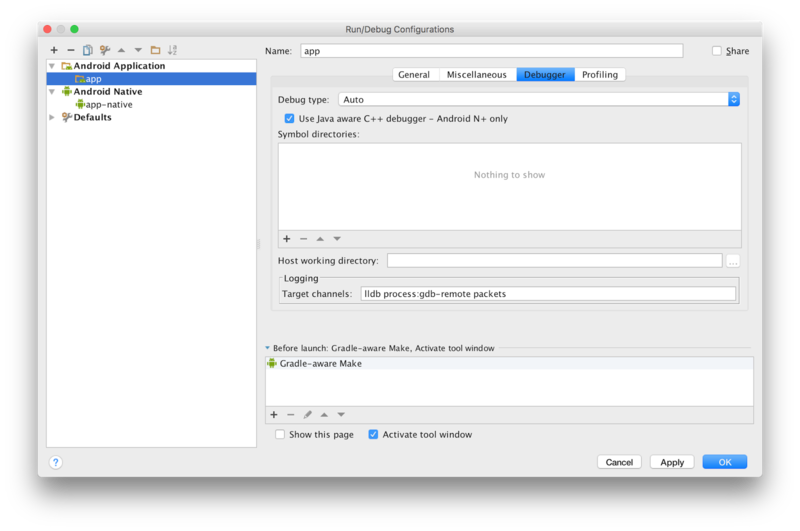 Auto Debugger Selection: Android Studio apps can now use debugger type “Auto.” This will automatically enable the appropriate debugger — the Java language aware C++ debugger if enabled and otherwise the hybrid debugger for C++ projects. Projects exclusively using the Java language will continue to use the Java language debugger. If you are using a previous version of Android Studio, you can check for updates on the Canary channel from the navigation menu (Help → Check for Update [Windows/Linux] , Android Studio → Check for Updates [OS X]). This update will download a new version, and not patch your existing copy of Android Studio. You can also download Android Studio 2.2 Preview fromcanary release site. For the Android Studio 2.2 Preview, we recommend you run a stable version alongside the new canary. Check out the tools site on how to run two versions at the same time.